Chris Moore is a percussion educator and performer residing in Birmingham, Alabama. His jazz vibe combo, The Chris Moore Project, has performed throughout the southeast, including performances at City Stages, Kentuck Arts Fest, and The Gulf Shores Shrimp Festival. A sought after clinician, his specialty is paying homage to the founders of the instrument, specifically Cal Tjader, Lionel Hampton, Milt Jackson and Red Norvo. His jazz combo, The Friends In Jazz, has performed at jazz and arts festivals throughout the southeast as well. 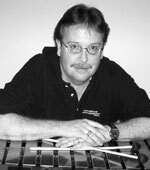 Chris has taught percussion in the Birmingham area for over 30 years. His groups have made regular appearances at PASIC competitions as well as national festivals and conventions. He has served as percussion instructor at such schools as Vestavia Hills, Clay-Chalkville, and Oak Mountain high schools. In addition, he has served on the adjunct faculty at the University of Alabama at Birmingham and Samford University. He is a sought-after adjudicator, and regularly judges marching contests throughout the southeast. Chris is a former President of the Alabama Chapter of PAS, and was named “Chapter President of the Year” for 2004.